Widge, an orphan, has been taught the art of shorthand, making him a valuable asset for dishonest people wishing to copy the words of others. At the start of this book, Widge is purchased by Simon Bass, a theater director who wishes to have him steal Shakespeare's Hamlet by seeing the play and writing down every word. When Widge arrives at the Globe theater, however, he has trouble completing his task. First, he becomes so engrossed in the action of the play, he forgets to copy down the lines of dialogue. On his second attempt, he copies the whole thing, but then loses his notebook. He decides to try getting it back, but in order to do so inconspicuously, he must sign on as a prentice to the theater. While pretending to have a strong desire to act on the stage, Widge begins to feel a sense of family and belonging among the other Globe prentices, and he begins to question whether he should steal the play after all. This fast-paced and suspenseful novel is everything historical fiction for kids ought to be. 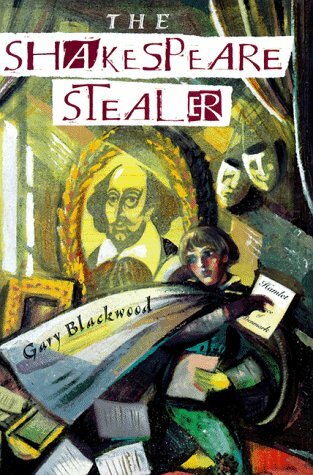 Rather than simply laying out a series of historical details for young readers to absorb, author Gary Blackwood artfully weaves details about the Globe theater, the life of a prentice, the story of Hamlet, and Shakespeare himself into a truly engaging and exciting story starring a believable and sympathetic hero. Kids will be drawn to the danger and mystery surrounding Widge's duplicity, both with his master, and with his fellow prentices. They will also enjoy the banter between Widge and his prentice friends, which has a contemporary ring to it, despite the occasionally old-fashioned language. (Widge's interactions with his friends remind me a lot of the way the kids talk to each other in The Thieves of Ostia, which is written in a similar tone and style.) There are also a number of surprises revealed in the latter quarter of the book which are tangential to the main plot, but still so satisfying, and so unpredictable. It is very easy to tie this book into a history or literature lesson. Kids get to see Shakespeare as a person, and imagine how it might have been to work for him, or to see his plays as they were first performed. They also learn how special effects were achieved in those days (puncturing a sack of animal blood to make a joust look bloody, for example) and the restrictions preventing women and girls from taking on acting roles at all. The underlying theme of honesty vs. dishonesty adds a nice moral dimension to the story, too, which encourages kids to consider the importance of doing the right thing, even when it makes things more difficult. The use of disguises to highlight this theme is also handled very well, and gives the reader a concrete way of thinking about deception. The Shakespeare Stealer is one of my favorites of this project so far. Fortunately, it's the first book of a trilogy, which continues in Shakespeare's Scribe and concludes with Shakespeare's Spy. I won't get to the sequels for a while, since I still have 30 historical fiction novels to go, but they are definitely going on my to-read list, as I'm sure they will for kids in grades 4 to 8 who choose to read this book.